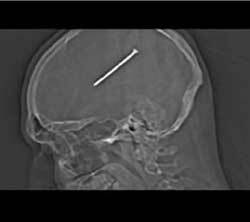 A DIYer from Chicago has had a very close call when he accidentally fired a three inch nail into his head with a nail gun. The 34 year old, Dante Autullo, was unaware that the nail had actually entered his skull, as was his partner, who cleaned up the small wound. In actual fact the nail was millimetres of reaching the area of the brain which affects mobility. It was only when Dante started feeling nauseous the following day that they decided he should go to the hospital. Having taken the x-ray and discovered the nail, the doctors operated for two hours to remove it safely, and Dante is now recovering.